I must admit that I think I have made quite a few mistakes in this Install. I was told that 6.0 is not supported by PernixData yet, but it has been known to work. So I installed a 5.5 VCSA instead, and voila it joined my AD without any problems that the 6.0 had. (Guess I need to try the 6.0 VCSA again). Then Uninstalled and Reinstalled the PernixData Management Software, and still no plugin showed up. My friend @FrankBrix told me to look at the log files of the FVP software, and yes it would obviously there. The logfiles clearly showed that the software couldn’t connect to the SQL server, and I Discovered I had entered the wrong password!. One thing there, I do think the Installed could have checked that instead of just writing it to a config file. After correcting that, the FVP plugin worked on 5.5. I thought that I would give 6.0 a shot again before configuring anything in FVP, and I could also get the FVP plugin to the 6.0 vCenter. However it kept giving me authentication errors, each time I tried anything with FVP. So I went back to 5.5 (now my 4.th vCenter install) and followed the guide to create an FVP cluster. After that I tried to add resources to my cluster, but it kept saying that “No PernixData compatible hosts have been detected…” So I double checked that the VIB was actually installed and I tried rebooting the ESXi, but to no avail. Again @FrankBrix to the rescue. We setup a WebEx and in like 30 seconds after he took over my screen he had solved my problem. After reinstalling and creating datacenters and clusters 4 times, the last time I had accidently forgotten to put my host INTO the cluster. No wonder FVP couldnt get any hosts. With that fixed PernixData started its magic. And WOW I must say, I can already feel a big difference from the last days without caching, and I’m looking forward to seeing the write Cache in action once I get all my machines up to speed again. 57.000 IOPS saved from my small little 4 disk Synology, no wonder I can feel a big difference. And the Latency really has gotten down as well. you can see a Big spike at around 10:22PM from the datastore, but the VM never saw it. And this is from a single cheap Kingston SSD. Will have to try this out in a heavier environment than my homelab sometime soon. I will post more stats when this has been running for some time. Once again a big thanks to @frankbrix http://www.vfrank.org/ for the help. 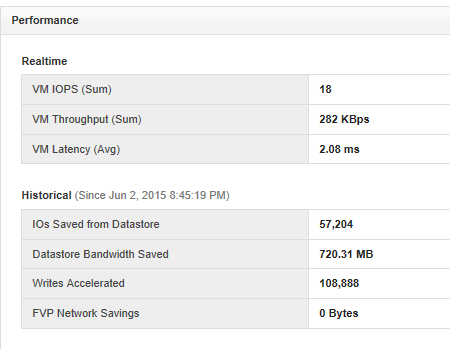 ← PernixData FVP in the Home Lab Part 2.